An expository guide outlining the victories, betrayals and reversals of this fascinating period of Israel's history—and the incredible grace and amazing promises of Israel's unchanging God. 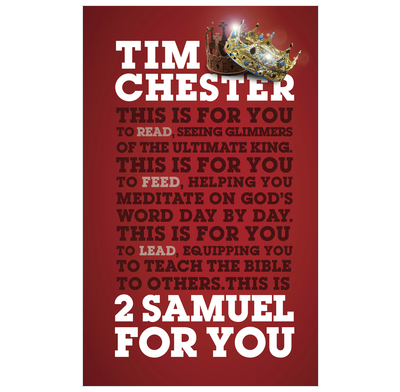 2 Samuel is a story of triumph and disaster, both personal and national. It is the account of the rise and fall and rise of a great king, David of Israel. But it is also the story of the God who rules his people, who forgives his people, and who promises to send the King whose greatest fall will bring our eternal rise. This accessible, absorbing expository guide opens up this book for new and mature Christians alike. It is less academic than a commentary, making it a great resource for personal devotion, as well as useful for leading small group studies or sermon preparation. There is an accompanying Good Book Guide available. An exceptionally strong insight into the nature of David. He wore his heart on his sleeve and so often we can find echoes of our own feelings in his psalms. It is reassuring to know God loved David's honesty, even when he was angry with God. This book helps explore David, and is well worth a read.